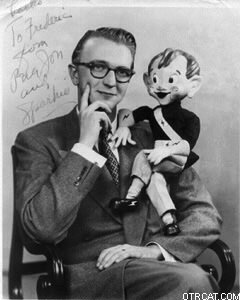 "Over The Falls In An Airplane"
The show began as a half hour, and was changed to a syndicated twelve-plus minute radio serial format in 1951. These rare episodes are from that period. Mayor Plumpfront, is getting married to the "fabulously wealthy" Florida widow Daffodil Dilly. We are with the boys coming back from an adventure-packed trip to Africa, and as the wedding plans near completion, kidnappers take Daffodil Dilly! The boys work to crack the case. The second major adventure in this group is a mystery involving Bunny, Sparkie's Boston Bulldog. It's called "The Canine Mutiny." 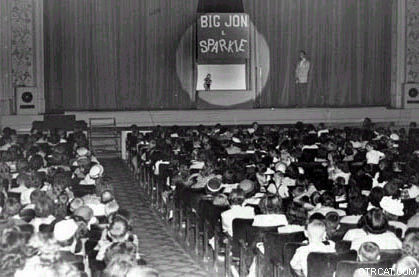 The small-town qualities of so many old time radio favorites such as Fibber McGee and Molly, the Great Gildersleeve, Vic and Sade and are mirrored in The Further Adventures of Big Jon and Sparkie. And it's not a stretch to say that Jon Arthur liked I Love a Mystery. What radio adventure serial after Morse's I Love a Mystery wasn't influenced by its finely drawn, individual characters dealing with unexpected twists of plot?The Further Adventures of Big John and Sparkie developed through the 1950s and went to a longer format broadcast on Saturday mornings as "No School Today." Sparkie's irrepressible sense of belonging in a real if slightly wacky world, is very involving. John Dunning, in "On the Air, The Encyclopedia of Old Time Radio," says "It remained, for those who heard it, one of the "
For more charming children's adventure serials see also: Air Castle, Cinnamon Bear, Magic Island, and Little Orphan Annie. For older kids, there are many action-packed old time radio shows, some of them in the15 minute serial format. A few are Air Adventures of Jimmy Allen, Speed Gibson,Cisco Kid, Captain Midnight, Superman, The Green Hornet, Sergeant Preston of the Yukon, and Space . My wife’s figures I’ve “lost it “ about this Big John and Sparky download. One minute to go with the download. I listened to this two-year series beginning in 1950. I can hardly wait to “see” how many of the programs I can remember. I know of two episodes very well. WOWIE! I have gotten my dad the big John and sparky cds and he is looking to find the songs from the show...the theme song, the birthday song and other various songs from the show. they did have a Saturday show of "No School Today". I believe it ran on ABC from 9 to 10 am and it was sponsored by Reubels Rye Bread and Barq's Root Beer, both Cincinnati products because that is where the program was broadcast. I was listening to it while we lived in Central New Hampshire and my mother told me that I was born in Cincinnati. Big Jon played a lot of children's records and even had a marching song played by Gil Houlihan and his Leprechaun Marching Band. You would march around the breakfast table. 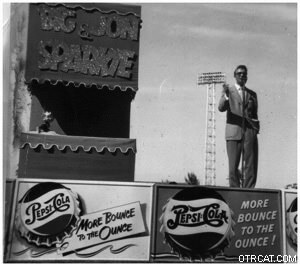 It also was on WCPO TV in Cincinnati during the Fifties. The show was off the air by the time I was old enough to remember what I heard on the radio. I've heard one of Big Jon & Sparky records (Little Red Caboose/Run, Rabbit, Run). But I do remember Rubel's Rye Bread--that was my dad's favorite rye bread. I wish they still made it--it was delicious. It didn\'t matter. You would still ride the magic carpet. Love that memory, and Cincinnati\'s Dancing pig.